French braid hairstyles are timeless because they complement every outfit. Forever classics, they are perfect for every occasion or appearance. Perfect for weddings, dinner dates, or all day exercise, they’re as fancy as they are functional, and can be dressed up or down for any occasion. All you need to do is to master a few braiding techniques and then get a bit creative. The French braid is a timeless but versatile hairstyle that runs the gamut between Boho chic and classically elegant, as well as every style between. It’s no longer just for long hair, you just have to get a little inventive. Braiding is like an art form, and some techniques are hard to learn. French braiding need not involve all of your hair. A side braid is really easy to adapt into a French version. A deep parting is always more dramatic, but it all depends on the look you want. Variously known as a braided headband, a crown or milkmaid braids – these hairdo looks really cute. This is ideal for second-day hair, or for any other ‘bad hair’ day. Another plus of this do is that when you unravel the plaits, you are left with gorgeous waves. It’s worth learning braiding techniques and their many variations. This is perhaps because no other hairstyle is capable of suiting almost every hair length, texture and type. If you have long, thick hair, it might be helpful to separate your braids a bit. Sporting multiple braids is an eye-catching take on the traditional style, and it all comes together in a perfect plait. Perfect! Side ponytails are having a major comeback, but anything you can do to dress up the ’80s throwback is definitely encouraged. Braids and ponytails pair together beautifully. Again, the variations to this style only depend on how creative you are! This is stunning, but even though it might involve you spending a lot of time with your arms raised as you pose between two strategically placed mirrors, it’s worth the effort. The upside down braid is eye-catching enough, but the way it continues to circle a thick, beautifully formed bun is really kind of magical. What’s better than one French braid? Many of them! Try them. This hairstyle is half up, and that part is half braided and half twisted into a messy bun. It actually works, although it’s a little … inventive, let’s say. This cute and relaxed style is ideal for slightly curly or wavy hair. If your hair is straight, scrunch it with sea salt spray to achieve effortless-looking beach waves. Braid a loose braid to one side to frame your face. Make the end braid appear loose and relaxed by slightly easing it out with your fingers, both at the roots, as well as at the end. Secure the end with a small elastic. Starting right over one of your ears, braid a large chunk of your hair. Keep braiding and adding strands of hair, until you’ve reached the tips. Make sure the braid remains loose and relaxed throughout – if you eventually decide to opt out of the updo, you can simply wear it as a bohemian chic side braid. To complete the updo, tuck the end of the braid in and secure with a few hairpins. Since this is pre-eminently a hippie look, you can also try embellishing the do with some flowers – mogras or even artificial daisies. If you think that your braiding technique is a bit rusty, or if you’re simply on the lookout for a cool, relaxed hairdo, this is the best style. Why? Because the weakness that you can’t make it neat is actually your strength. 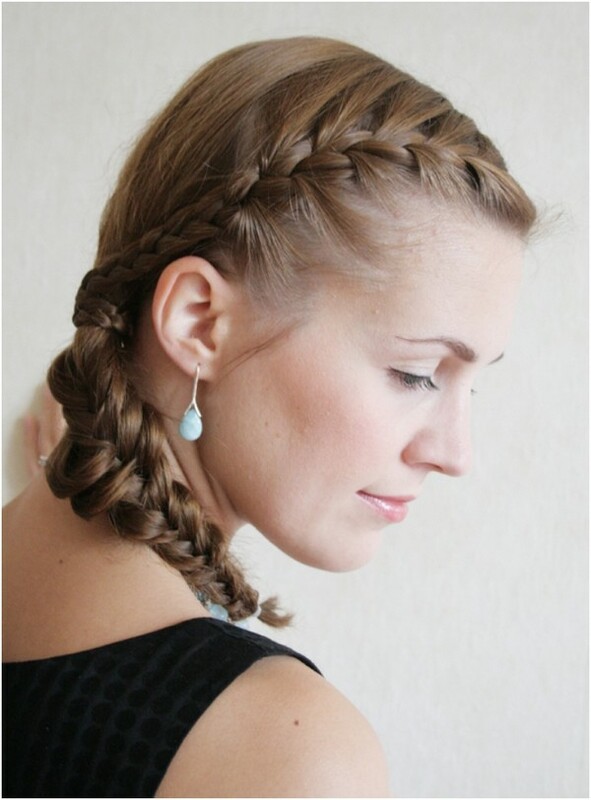 To braid your hair for this style, pull it back and start at the top center point. Divide your mane into three sections and start braiding. At each crossover, add a small section of hair from the sides. As you work your way down the length of the hair, feel free to incorporate larger strands. Once you’ve run out of locks on the sides, feel free to braid the remainder into a normal style. Add a spritz of finishing serum and – presto! 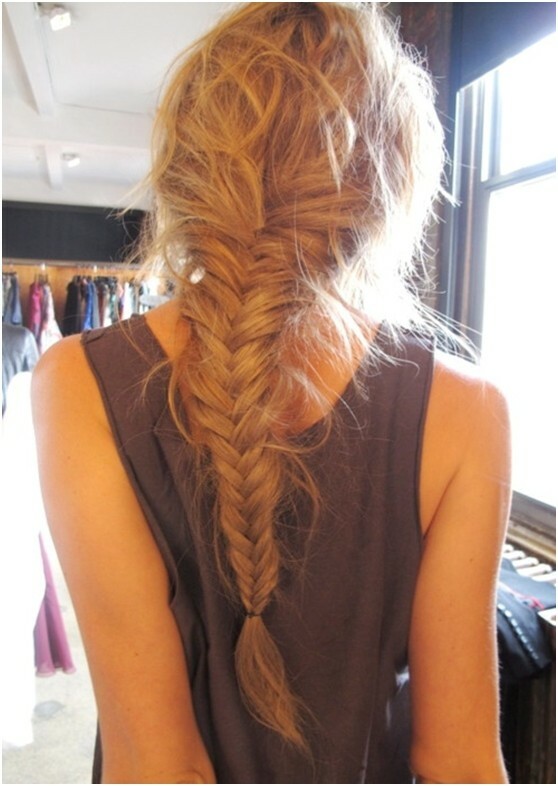 Here’s your picture-perfect braid!